In a mug, combine all the liquid ingredients. Top with approx. 5 oz hot water. Stir briefly. 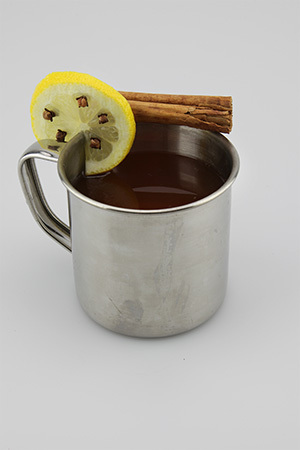 Garnish with clove-studded lemon wheel and cinnamon stick. *To make honey syrup, simply dilute 1 cup honey with 1/2 cup hot water, stirring until integrated.